Easy Chicken Corn Soup recipe by Dr. Sr at DesiRecipes.com. First make broth: add 4 cups of water to chicken in pan, along with sliced onions, garlic cloves, salt and pepper. Strain the chicken broth and throw away onions and garlic . Measure broth in cups and pour into a bigger pan, add more cups of water to it equivalent to number of people being served. Add one extra cup for cooking. Add corn and shred chicken and bring to boil. Now add soy sauce and chili sauce (may add while serving if desired). Mix 4 tbsp cornflour in about half cup cold water and stir well.. make sure soup is on boil and add cornflour while stirring. You may keep adding 2 tbsp cornflour mixed in 3/4 cup water to soup till desired thickness is obtained. Lastly add the eggs, slightly whipped while stirring. It is really very delicious. I make my own many many time. veryyyyyyyyy spicy but nice hehe gud! 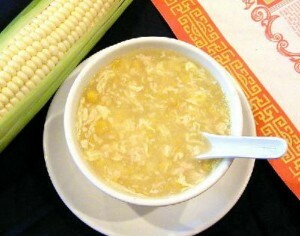 This is the actual and simplest recipe of corn soup..it definitely tastes great! !